Here's the The Lowdown from DNJournal.com! Updated daily to fill you in on the latest buzz going around the domain name industry! 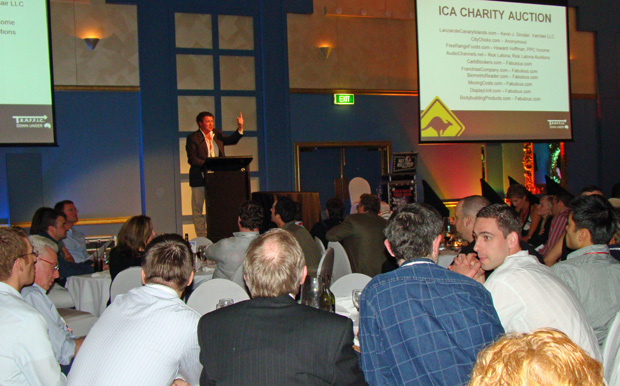 The ten-name auction wound up producing over $18,000 for the ICA, the non-profit domain industry trade association. The top sales were BodybuildingProducts.com at $5,200 (purchased by T.R.A..F.F.I.C. Co-Founder Howard Neu) and MovingCosts.com at $5,000 (purchased by Darren Cleveland of the Recall Media Group). Both of those domains were donated by show organizers Fabulous.com. Howard Hoffman of PPCIncome.com was also very active in the auction. In addition to donating a name that sold for $1,000 (FreeRangeFoods.com), Hoffman purchased two domains. The sale was run by a talented young Australian auctioneer, Chris Norris, who will also conduct the Aftermarket.com and Rick Latona.com auctions today. The Wednesday schedule featured four seminars on topics ranging from Acquiring Domains and Web Development to Monetization Alternatives and Asset Sales. I'll have details on those in our comprehensive show review article that will be published late next week after I return to the U.S. I do however want to give you a little preview to build some suspense. The photo below was shown by one of the panelists (a well known and much loved figure within the industry) during his presentation. It was snapped during the final leg of his roundabout journey from the U.S. to Australia. 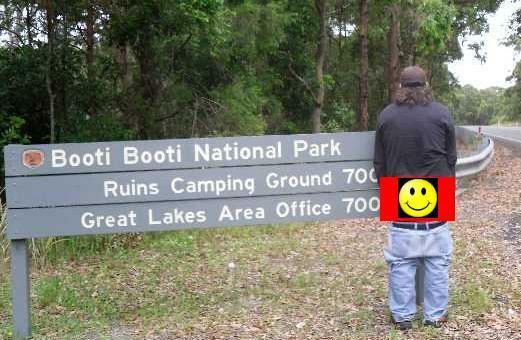 While traveling by car from Sydney to the Gold Coast, nature called and the moment happened to be caught on camera. Other than the strategically placed happy face, this is not a doctored photo. Can you guess who this is? We'll reveal all in our upcoming show review article - not that you will want to have anything else revealed after seeing this! I guess the takeaway on this is that as brilliant as our fellow domain traveler is, he is sometimes prone to read a little too much into things he sees. Soon after the much appreciated comic relief, Graeme Wood, the Australian founder of travel giant Wotif.com, delivered an interesting keynote address on the building of his groundbreaking company and the selection of its unusual domain name. They were originally after WhatIf.com but, despite going as far as hiring a private detective, they were unable to locate the owner of that domain and wound up improvising with great success. The rest, as they say as history. We'll have more on Wood's talk in our upcoming review article. Once he was suitably attired, Kubba was put through a dance routine that can't really be described in words. I did notice Fabulous.com had a video camera rolling at the back of the room so I have a feeling the performance will eventually surface on YouTube where it should be a runaway hit. Kubba is always a great sport and Hollywood certainly picked the right guy to make this routine shine and bring the curtain down on a night that sent everyone back to their rooms with a smile on their face. Now, its back down to the conference floor for me (as I write this the opening live auction is only an hour away). I'll have another update from Australia for you tomorrow when I will recount Thursday's highlights from T.R.A.F.F.IC. Down Under.